The property is situed in olive grove of 4.500 m2 , with private pool and BBQ, enjoys full sun all day, overlooks Soller . Sóller and Port de Sóller just 2,500 . Nice chillout! The house has three separate areas outside for you to relax in. Beautiful views over Soller. No neighbours but close to everything. Internet access wi-fi free. It is a perfect place to celebrate family holidays for a group of friends or a couple . Relax in the comfortable 4 terraces having a dinner al fresco, with barbecue and enjoy the pool and the traditional character of the house. The house is suitable for children, since access to the stairs and terrace are closed by protective barriers. Close to the beach of Puerto de Soller (3 km) Soller is well known for the nice train and the funny tram, the stunning hiking itineraries you can do in the area, the oranges and citrus trees.... Welcome to the Valley of oranges! Close to shops and restaurants. Amenities and only very shorts drive (five minutes). Private Pool, with sun bathing area with lounger and chairs. The house is of 130 m2. A rustic fireplace with traditional charm. From April to October changeover day is on Saturday. Towels for bathroom and towels for the pool. An amazing house with amazing views from lots of sitting areas. Pool beautiful if a bit chilly in April! Lovely walk into Soller town. Lovely property but best when the sun is shining. Humi is very hospital and welcoming. Beds were very comfortable and as we were 7 in total (ages ranging from 31 -84 ) when the sun was shining and we could use the different terraces it worked well. We thought that the kitchen was too small for the size of the property as it was like working on a boat. However we also had 3 days of rain, and that made it challenging. Lovely views and enjoyed Clara and Quanita the two sheep who are both fond of cornflakes, although Quanita certainly made sure she got more than her fair share! The first two days were very noisy with the car rally but also made it memorable. We loved Soller and found a wonderful Fine Dining Restaurant called Salvia well worth a visit. Also my husband and I really enjoy Port Soller walking, and swimming in the bay. Yes I would recommend to our friends. Hello family, thank you very much for your good review. I am glad to know that you had a good stay and you enjoyed the terraces, their views to Sóller... and the sheep, which until now they had no name and after your stay they are already baptized! Yes, you had bad luck with the rain and races. I take note of the restaurant, so I can advise the next clients and myself, as I want to go...of course! I am happy to know you liked our house and you look forward to coming back! A fantastic house in a great location. Humi was very welcoming and helpful at the property. We loved our stay here, thank you so much! Thanks for your good review! It is very gratifying to know that you felt good in our house and you loved your stay here. A beautifully varied space to stay in. So many outside spaces to enjoy, the pool being the jewel in the crown. It's underlit at night, and some of our most joyous moments were taking night time dips in it! The barbeque area was great, supplemented by an outdoor gas ring. That was new to us, and we had a great time cooking paella and fabada in it. 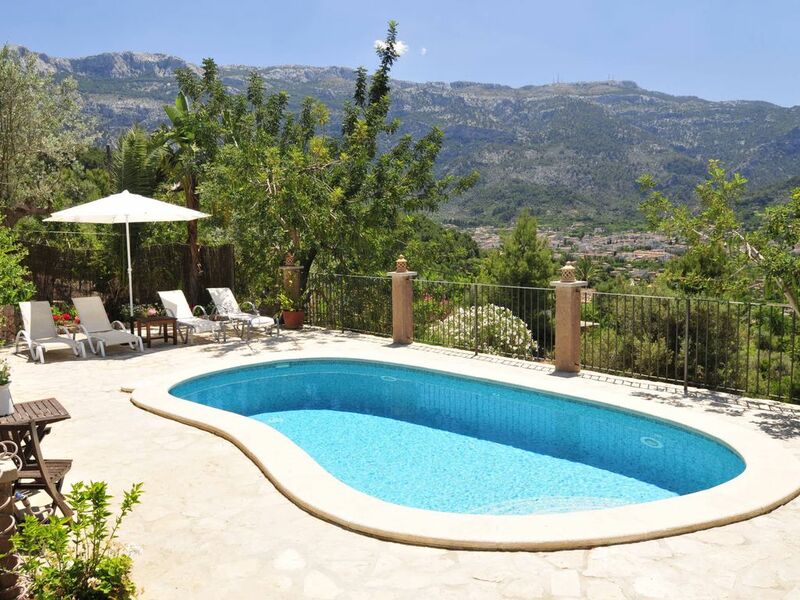 The villa is within easy reach of Soller and Port Soller. It's on the fabulous MA10, the corniche road connecting all sorts of spectacular places from Andratx in the west to Pollenca in the east. Humi the host is warm, texting happy birthday to my partner when photos of our passports revealed to her that her birthday fell in the week of our stay! All in all, the place is a winner. Many, many thanks for your good review !!! I am happy to know that you enjoyed the various outdoor spaces and especially swimming at night in the pool! It has been a pleasure to have you here! Great outdoor living areas! Super pool and chill-out area! Excellent views over Soller and up to Serra de Tramontana. Kitchen and bedrooms quite compact, but house is well equipped and comfortable. I am glad to know that you have enjoyed the pool and the terraces with their beautiful views of the Serra de Tramuntana. This house is in an olive grove of 4.500 m2, with a few wonderful views over Soller. The house has three separate areas outside for you to relax in. Sóller has lots of restaurants and bars mainly around the central village square. It is very pretty and has plenty of shops, banks and local market. The port has lots of bars and has some particularly good fish restaurants. From the place excursions are realized for hiking for the whole north coast (great tour-GR). Also mountain biking available. From April to October changeover day is on Saturday. In the price it is all included, water,electricity., white towels and bed linen.. There are towels for the pool.... 25% in advance to bank account. Enquire for details. In winter, November to March, the heating and cleaning is included . Check-in is is after 13:30h - Check-out at 10h From April to October changeover day only on Saturday.